We use only the best fabrics in a wide range of colors and patterns. Our selections include Absecon olefins, Tahoe blends and Piedmont or J.B. Martin fully-woven 100% cotton velvets. We finish your materials with skillful seaming using bonded nylon thread. The finished cushion is then hand-tufted with matching fabric covered buttons. 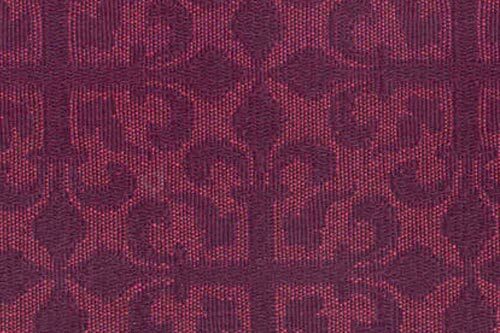 For churches with special decorating needs, we also purchase fabrics from leading manufacturers like Maharam, Designtex, Kravets and others. 100% cotton velvets come in a complete array of colors but currently no scanned images are available. In addition to fabric colors and patterns, we also ensure our standard fabrics meet your durability and safety needs. All standard fabrics meet Heavy Duty upholstery standards with durability ratings of 15,000 to 250,000 double rubs. All standard fabrics are treated with DuPont Teflon (or similar) stain protection at the fabric mills. All standard fabrics meet the UFAC class 1 or California #117 flammability standards. With extra treatment, most materials will meet NFPA #701, Boston Fire, Code or California #133 standards if needed. Special dye-lots – We can customize colors to give you the look you want. The mills have special size and availability requirements. Ask your Waggoner’s representative for details. Customers-Own-Materials (C.O.M.) – We are willing to work with fabric you or your decorator provides. Be careful, because some fabrics you may select do not work well on long church pews. Often, once we have seen your selection, we are able to identify the mill and/or make arrangements for the fabric to be purchased less expensively. 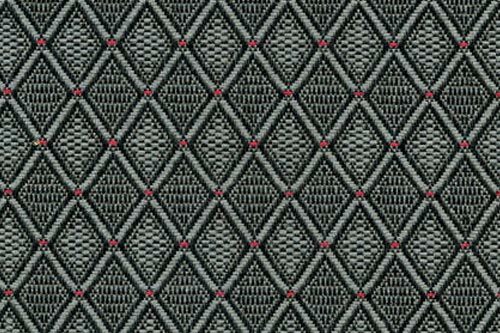 Waggoners works with you to select the appropriate combination of materials for your project and is happy to work with your congregation to obtain a specific fabric or color that you desire. We can provide sample materials for your church to help you make the best selection. We are one company that takes great care with the specifications of the foam we put inside our cushions. Our two-inch high-density polyfoam is picked specifically for use on your church pews so you know it will last long and feel right. 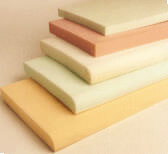 Various foam thickness and densities are offered to provide long-lasting comfort and support at each service. Our high-resilience foam is the premium foam available today. Your Waggoner’s representative can explain and let you experience the various types of foam, so you can create a truly comfortable and durable pew cushion for your pews. The density (or pounds per cubic foot) of foam is an important measure of quality. The more raw chemicals in polyurethane foam, the more durable and comfortable it will be. Cheaper foams will have a 1.2-1.7 lb density; premium foams will be in the 2.4-3.0 lb range. All Waggoner’s foams are 2.4 lb and above. 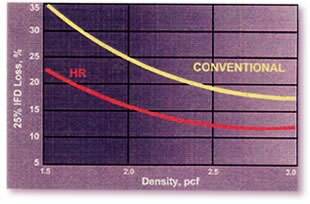 The firmness of the foam (or its Indention-Load Deflection or ILD) relates how much “give” there is to polyurethane foam. The proper firmness depends upon the application. For back foams, an ILD of 20-30 lbs is ideal; for pew seating an ILD of 45-55 lbs is best; and for kneeling foams you’ll want an ILD of 75-95 lbs. 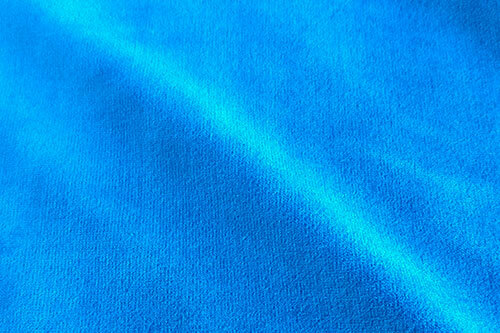 This spun polyester material is light and fluffy and is often used as a replacement for very soft foams. In pew cushions a layer of dacron wrap is most often used to provide an extra soft feel and pillowy look to the cushion pad. A Report Prepared by Waggoners, Inc.
A foam should not “bottom out” when a person sits or lies on it. A soft surface with a firm interior is preferred by most consumers. 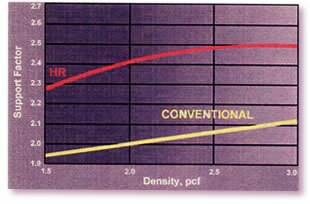 The relationship between the surface firmness and the inner support is called the Support Factor. To measure the Support Factor, the number of pounds of force required to compress a foam sample 65% of its height is divided by the force needed to achieve 25% sample compression. The higher the ratio, the more support. Higher Support Factors are extremely desirable. Dynamic Fatigue is an indication of durability. Foams are subjected to a torture test of weight and abrasion far exceeding what they would ever encounter in the home or office. A heavy weight is rolled over the foam sample 20,000 times. 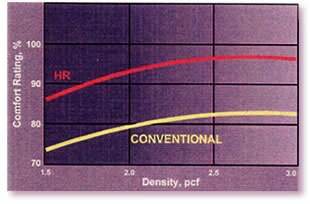 The amount of IFD loss (i.e., how much firmness the foam loses) indicates long-term cushions performance. The lower the number, the better. Foams with better Dynamic Fatigue ratings will maintain their firmness longer and resist uneven wear such as that caused by a “favorite spot” on the sofa. Ideal support is offered by a “straight line” deflection profile which means that support increases in proportion to the applied force. This yields a support factor of 2.6, which has been assigned a Comfort Rating of 100%. If a cushion falls short of 100%, comfort is compromised. However, the higher the rating the better the finished cushion will feel.